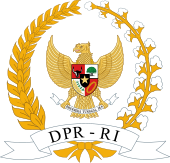 The People's Representative Council (Indonesian: Dewan Perwakilan Rakyat, DPR), alternatively translatable as the House of Representatives or as the House of People's Representatives, is one of two elected national legislative assemblies in Indonesia. The house has been the subject of frequent public criticism due to perceived high levels of fraud and corruption. 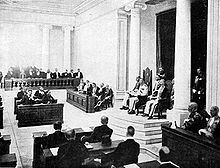 Dutch East Indies Governor-General Johan Paul van Limburg Stirum opens the first meeting of the Volksraad in 1918. In 1915, members of the Indonesian nationalist organisation Budi Utomo and others toured the Netherlands to argue for the establishment of a legislature for the Dutch East Indies, and in December 1916 a bill was passed to establish a Volksraad (People's Council). It met for the first time in 1918. Ten of its nineteen members elected by local councils were Indonesians, as were five of the nineteen appointed members. However, it had only advisory powers, although the governor-general had to consult it on financial matters. The body grew in size to 60 members, half of who were elected by a total of 2,228 people. In 1925, the Volksraad gained some legislative powers. It had to agree to the budget and internal legislation, and could sponsor laws of its own. However, it had no power to remove the governor general and remained nothing more than a gesture. In 1940, after the German invasion of the Netherlands, and the fleeing of the Dutch government to exile in London, there was a motion calling for an inquiry into turning it into a quasi-legislature, but this was withdrawn after a negative response from the government. In July 1941, the Volksraad passed a motion calling for the creation of a militia made up of up to 6,000 Indonesians In February 1942, the Japanese invasion began, and in May 1942 the Dutch formally dissolved the Volksraad. It was replaced by a council made up of heads of departments. The Japanese invaded Indonesia in 1942. By 1943, the tide had turned against them, and to encourage support for the war effort, the Japanese appointed Indonesian advisors (sanyo) to the administration and appointed Sukarno leader of a new Central Advisory Board (Chuo Sani-kai) in Jakarta. In March 1945, the Japanese established the Investigating Committee for Preparatory Work for Independence (Indonesian: Badan Penyelidik Usaha Persiapan Kemerdekaan) or BPUPK, chaired by Radjiman Wediodiningrat, with Sukarno, Hatta and Thamrin among its members. This body drew up a constitution for an independent Indonesia over several weeks of meetings. At a session of the Committee on 1 June 1945, Sukarno laid down the principles of Pancasila by which an Indonesia would be governed. On 7 August, the day after the atomic bombing of Hiroshima, the Preparatory Committee for Indonesian Independence (Indonesian: Panitia Persiapan Kemerdekaan Indonesia) or PPKI was established. Sukarno was chairman, and Hatta vice-chairman. The two proclaimed the Independence of Indonesia on 17 August. 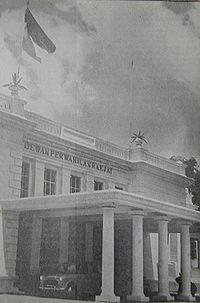 On 18 August, the PPKI accepted the constitution drawn up by the BPUPK as the provisional Constitution of Indonesia and decided that during a six-month transition period, the new republic would be governed according to the constitution by a president, assisted by a National Committee, who would establish the two chamber legislature mandated by the constitution. The upper chamber, the People's Consultative Assembly would then have six months to draw up a new constitution, leaving open the possibility that this would be an entirely new document free of the influence of the situation prevailing during World War II. The PPKI also named Sukarno as president and Hatta vice-president. The Central Indonesian National Committee (Indonesian: Komite Nasional Indonesia Pusat) or KNIP was a body appointed to assist the president of the newly independent Indonesia, Sukarno, on 29 August 1945. It was originally planned to have a purely advisory function, but on 18 October, Vice-president Hatta issued Decree X transferring the powers the Constitution conferred on the People's Consultative Assembly and People's Representative Council from the president to the KNIP. The day-to-day tasks of the KNIP would be carried out by a Working Committee. During the War of Independence, the entire KNIP was unable to meet regularly. Therefore, the KNIP acted as the upper house, the People's Consultative Assembly in the constitution, meeting only infrequently to discuss fundamental and pressing national issues, while the Working Committee acted as the day-to-day parliament. In January 1948, the Dutch authorities established the Provisional Federal Council for Indonesia (Voorlopige Federale Raad voor Indonesia) comprising Lieutenant Governor Hubertus van Mook and eight Indonesians chosen by him to represent the views of Indonesia. Two months later, the council made up of heads of departments that the Dutch had set up to replace the pre-war Volksraad officially became the Provisional Federal Government (Voorlopige Federale Regering). This body invited heads of the states making up the United States of Indonesia to send delegates to the Federal Conference in Bandung in May 1948. That month, leaders of states and other areas joined together to establish the Federal Consultative Assembly (Bijeenkomst voor Federaal Overleg or BFO) to represent the federal regions. Following the transfer of sovereignty to the United States of Indonesia (RIS), in December 1949, the state adopted a bicameral system, with a 150-member People's Representative Council and a senate with two representatives from each of the 16 component areas of the RIS. Initially People's Representative Council had 50 representatives from the Republic of Indonesia and 100 from the 15 component parts of the RIS. The plan was for elections within a year. The KNIP met for the last time on 15 December 1949 to agree to the Republic of Indonesia joining the RIS. This People's Representative Council met for the first time on 15 February 1950, but was soon overtaken by events as the federal system collapsed as the individual states dissolved themselves into the unitary Republic of Indonesia. 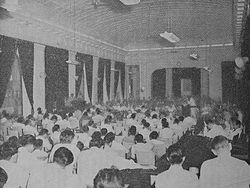 Given that the Republic of Indonesia did not want the RIS parliament to become the legislature of the unitary republic, in May 1950, Hatta and representatives from the federal states agreed to establish a new parliament comprising the 150 members of the RIS parliament, 46 members of the KNIP Working Committee, 13 from the Republic of Indonesia Supreme Advisory council and 32 RIS senators, making 241 members. On 17 August 1950, the RIS was formally dissolved and the unitary Republic of Indonesia came into being. The provisional People's Representative Council met for the first time on 16 August 1950. By then there had been minor changes to the agreed composition as three RIS senators had refused to take their seats and 21 representatives from the State of Pasundan were replaced by 19 members appointed by the Republic. Of the 236 members, only 204 took their oaths of office on 20 August, and only 170 voted in the election of the speaker, which was narrowly won by Sartono of the Indonesian National Party (PNI). Masyumi was the largest parliamentary party with 49 seats. The PNI had 36 seats and no other party had more than 17. In 1952, the DPR demanded a reorganisation of the Ministry of Defense and the dismissal of the Army leadership in response to military opposition to troop reductions. This led to the '17 October 1952' incident with large-scale demonstrations at the presidential palace by soldiers and civilians demanding the DPR be dissolved. The crowd dispersed after Sukarno addressed it. Despite the election bill being introduced in 1951, it was not passed until 1953 and elections were held in 1955. The results surprised everybody. The Indonesian Socialist Party did worse than expected, as did Masyumi, while the Indonesian Communist party did better than predicted. Following the election, the PNI and Masyumi had 57 seats each, the Nahdlatul Ulama had 45 and the PKI 39. There were now 28 parties in parliament, compared with 20 before the election. Only 63 of the 257 pre-election members of parliament still had seats, but there were 15 women members compared with eight before. The new parliament met on 26 March 1956. Over the next few years, public dissatisfaction with the political parties grew. In 1957, Sukarno announced his concept of a national unity cabinet and a National Council made up of functional groups to advise the cabinet. This Council was established in May 1957. On 5 July 1959, Sukarno issued a decree, which as well as reviving the provisional 1945 Constitution, dissolved parliament. The new DPR took office on 22 July 1959. It accepted the president's decree by acclamation and said it was ready to work as stipulated by the 1945 Constitution. However, in March 1960 it unexpectedly rejected the government's budget. Sukarno then dissolved it as it was seen as no longer fulfilling the president's hopes that it would work with him in the spirit of the 1945 Constitution, Guided Democracy and the Political manifesto (Manipol, the political ideology of the time). The DPR session ended on 24 June. Sukarno then used this difference of opinion with the legislature as justification for the establishment of a People's Representative Council of Mutual Assistance (Indonesian: Dewan Perwakilan Rakyat Gotong Royong, DPR-GR). The membership was no longer based on the results of the 1955 election, but was determined by the president, who could appoint and dismiss members at will. Political opponents were sidelined, and some who opposed the establishment of the DPR-GR refused to take their seats. As Masyumi and the Indonesian Socialist Party did not agree with Sukarno, they were given no seats, meaning there was no longer a parliamentary opposition. A number of representatives from various functional groups including the military were also appointed. As of mid-1962, there were 281 members; 130 from 10 political parties, 150 from 20 functional groups and 1 representative from West Irian. The responsibilities and duties of the parliament were dramatically curtailed as it was reduced to helping the government implement its policies. In 1960 it produced only 9 laws, compared with 87 in 1958 and 29 in 1959. It became little more than a rubber stamp for Sukarno's policies. For example, it passed a law allowing volunteers to be sent to participate in the 'Confrontation' with Malaysia. Following the coup attempt of the 30 September Movement in 1965, which was officially blamed on the Indonesian Communist Party (PKI), the DPR-GR was purged of PKI members – 57 communist members were suspended. On 14 November parliament resumed without the PKI representatives, including deputy speaker M. H. Lukman. In 1969, the government passed an election law that set the membership of the DPR at 360 elected and 100 appointed members. The number of representatives from the military increased to 75. Elections were finally held in 1971, having been delayed to allow preparations to ensure a victory for the government's Golkar organisation. Following the election, the words Gotong Royong were removed and the body became the Dewan Perwakilan Rakyat again. In 1973 the remaining political parties were reduced to two, the United Development Party and the Indonesian Democratic Party . For the remainder of the New Order, Golkar won absolute majorities at every elections, while the parliament did not produce a single law on its own initiative, its role being reduced to passing laws proposed by the government. In May 1998, President Suharto stepped down and the following year saw Indonesia's first free elections since 1955. Of the 500 seats, 462 were elected, while 38 seats were reserved for the military/police faction. In the 2004 elections, all 550 seats were elected. In the 2009 elections the number of seats was increased to 560. There are now no appointed military officers in the legislature. The DPR has three main functions, legislative, budgeting and oversight. It draws up and passes laws of its own as well discussing and approving government regulations in lieu of law and proposals from the Regional Representatives Council (DPD) related to regional issues. Together with the president, it produces the annual budget, taking into consideration the views of the DPD. It also has the right to question the president and other government officials. The President of Indonesia does not hold the power to dissolve the People's Representative Council. The People's Representative Council has 560 members resulting from the 2014 legislative election. There are representatives from 10 political parties. The DPR is chaired by a speaker and five deputy speakers elected from the membership. Speaker Setya Novanto resigned on 16 December 2015 after being found by a tribunal to have been in breach of the House Ethics Code when he tried to extort US$4 billion of shares from the Freeport mining company. He was replaced on 11 January 2016 by Ade Komarudin from the Golkar Party. This appointment sparked protests from other DPR members as many were absent due to the ongoing congress of the Indonesian Democratic Party of Struggle (PDIP), while the Golkar Party itself was still split into two factions. Novanto was later reinstalled as speaker, but resigned again in late 2017 after being named a suspect in another corruption case. In 2018, a new law rearranged the leadership and added a deputy speaker position, which was filled first by Utut Adianto. The commissions can meet with the president or ministers and can hold meetings to listen to public opinion. ^ Taufiqurrahman, M. (10 December 2004). "House, parties 'most corrupt'". The Jakarta Post. Archived from the original on 3 March 2016. ^ Siregar, Hotman (16 December 2015). "BREAKING: House Speaker Setya Resigns". Jakarta Globe. ^ Wardhy, Robertus; Siregar, Hotman (11 January 2016). "Golkar's Ade Inaugurated as House Speaker Amid Protests". Jakarta Globe. ^ Assegaf, Fardah (13 December 2017). "Hunt on for new Golkar chairman, House Speaker". Antara. Retrieved 16 January 2018. ^ "Utut Adianto, dari Grandmaster Catur hingga Wakil Ketua DPR - Kompas.com". KOMPAS (in Indonesian). 19 March 2018. Retrieved 8 April 2018. This page was last edited on 21 April 2019, at 12:39 (UTC).